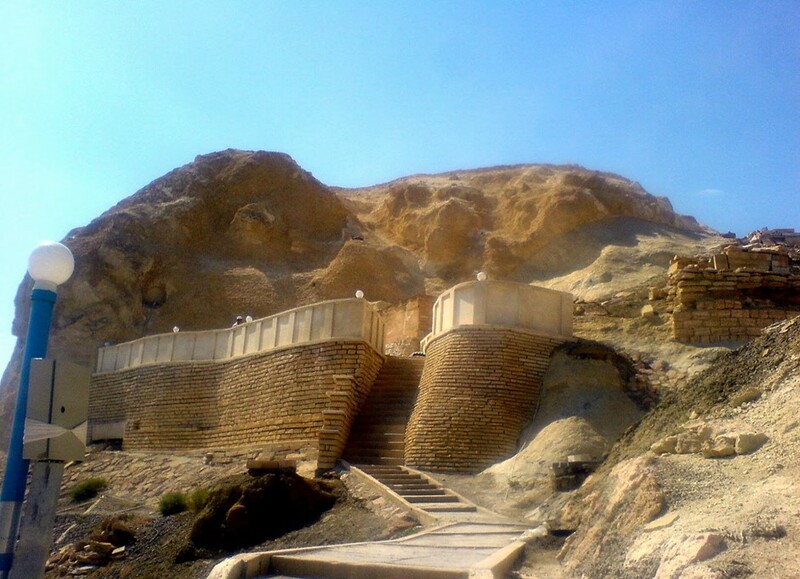 Тop-5 of most amazing, most mysterious and unusual religious places which can entrance even very sophisticated travellers. On the territory of our large country you can find absolutely everything that attracts tourists in different parts of the world. For example, mountains coated with eternal snows, lakes and rivers of inexpressive beauty, forests, vast deserts and steppes, canyons, caves, and many other things. Of course, all of these pleasean eye and makes a lasting impression on the heart of the travelers, but still ... Sometimes we would like to see something really unusual, right? Something so sacred that cannot be seen on a postcard or in programs about nature on TV. Where you could cheer up, immerse yourself in the mysterious atmosphere of the past, ask fora miracle. And yes, it goes without saying, there are such places in Kazakhstan! For your special benefit we have put together a top fiveof most amazing, most mysterious, and unusual religious places which can entrance even very sophisticated tourists. 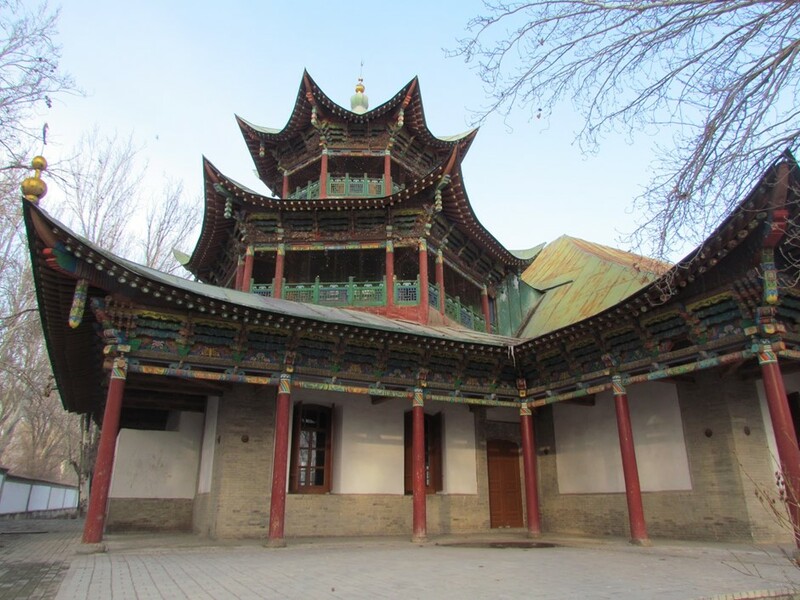 Let us get started with a very interesting buiding located in the center of Zharkent town- a mosque which is an incredibly vivid blend of Chinese and Central Asian style. What is remarkable - the famous Chinese architect Hong Pik was invited for its construction who managed to embody in the mosque traditional folk motives of almost all nationalities living in the region. There is a legend that Hong Pik had not built in his life nothing more beautiful than the mosque, even being in China. On hearing this, the Emperor of the Celestial Empire became furious and put the architect to death upon his arrival home. Unfortunately, most of his works had not survived test of thetime, but the mosquein Jarkent is something special. Even the most powerful earthquake of 1910 which had caused severe destructions had mercy upon the sacred building.It was built from the timbers of legendary Tien-Shan fir tree without usinga singlenail! Yes, the mosque has been gradually falling into decay, and breath ofthetime is already felt, but the ambience of the holy place holds own so that one does not want to leave, and a feeling of coziness and warmth envelops you from the first minutes inside. Starting with the entry portal you will feel the charm of oriental motives: an impressive central arch, towers, cartouches, gorgeous wall paintings depicting imaginary animals and plants. Inside you can expect even a more interesting view: altar ambry, walls and surbases painted with thousands of vivid stories, traditional Chinese lanterns, many sacred paraphernalia and decorations. 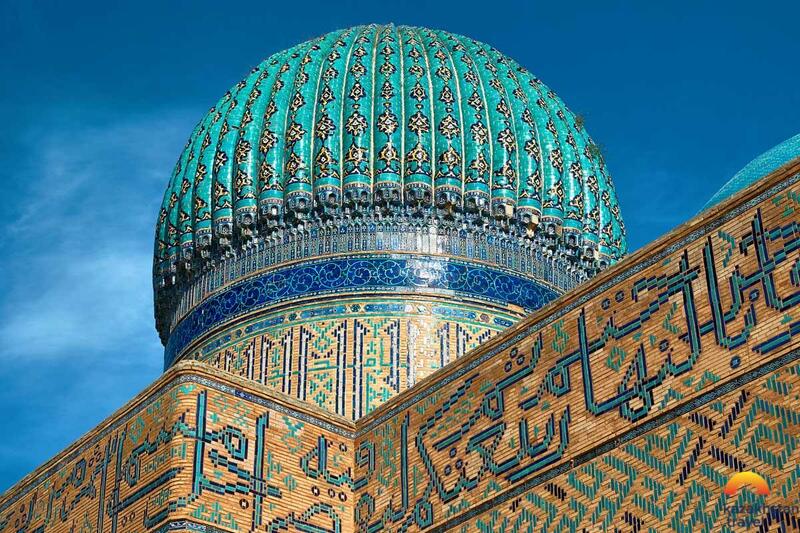 Now, there is a mosque-based architecture and art museum where you can admire the works of art of the Kazakh, Uighur, Dungan, and other nations. By the way, it was built using their monies. The mosque is located in the Centre of the city of Zharkent (only 30 km away from the border with China! ), Almaty region, at 40 U. Yuldashev street. The entrance fee is nominal - about 250 tenge (to take photographs indoors you will have to pay 500 tenge), so that you can enjoy this amazing place to your heart's content. Be sure to address the museum employees with questions about history of the mosque - they will tell you a lot of interesting things which could not be found on the Internet. Works of Abai Kunanbayev are familiar to every Kazakhstan citizen, they are translated into almost all world languages and resonate with the heart of every person. But behind all this there is another person, the one whose credibility, experience, and wisdom influenced the young poet - his father Kunanbay Uskenbayev. "He looked like a true steppe prophet, a judge of incorruptible honesty and exemplary Muslim ...", - that is how a revolutionary Adolf Yanushkevich wrote about him. As a senior sultan of Karkaralinsk region, Kunanbay was trying his best to be useful for his home people. He even managed to erect a hotel in Mecca, whichgave a free shelter to pilgrims from Kazakhstan. At his own expense he built in Karkaralinsk a madrassah and a mosque, which is still preserved, though not in its original form. More than 150 years have passed, and the memory of Great Abai's father has been living within its walls, on this beautiful lands. Kunanbay's Mosque is considered to be one of oldest in Kazakhstan and, unfortunately, its story could not be called simple. In 1920, minaret was demolished, the building was decaying, it was used as a school and a warehouse. Only in 1980, a decision on its restoration and transfer of believers was made. Now this magnificent building, located in a picturesque mountainous terrain on a small hill, pleases local inhabitants and tourists with its neat appearance. The mosque is functioning, there are marriages, daily prayers are given by believers and it is visited by tourists. The interior captivates with its simplicity and warmth - there is the national ornament everywhere, blue, green, and red colors prevail, painted rugs, log walls (the entire mosque is made of wood). Need to know: It is located in the town of Karkaralinsk and it is easy to get there, especially if you come by car. Near it, there isa regional Museum of Local Lore, History, and Economy where Kunanbay dropped in quite often, too. You can visit the mosque for free but, which is essential, remember to perform ablution and wear clean clothes, women must cover their heads with a scarf (if you forgot one - there are always some at the entrance). Severe but rich region of Mangystau is famous not only for its abundance of minerals but also for underground mosques which are well considered asan architectural pearl of this area. They are truly amazing buildings carved in the caves, cut rock, eye catching, and fascinating with its grandeur. There is no pretentiousness and grandiosity - only traces of the titanic work of our ancestors who left them to us, their descendants, as tacit admonition. All mosques date back hundreds of years, the age of some comes to a thousand. All this time dozens of generations lived, prayed, and died here, making the history of Kazakh people. The mosque has become surrounded by necropolis (graves), practically each of them has a zhatak (night’s accommodation) erected nearby. Modern tourists can spend a night there and experience full flavor of this holy place. Despite the fact that you find yourself near the graves, there is no feeling of longing and fear. Just calm and appeasement, as if the saints themselves protect your sleep. These mosques can well be called as holy places or energy sources. Touristsmention that absolutely everyone feltlike being born againafter tours to the underground mosques. Some give up smoking after years of indulging the habit, some get rid of diseases and ailments, while the others revisit their life, changing their way. •	Necropolis and underground mosque Shopan-Ata. It is carved out of the rock and is the largest of all. A sacred mulberry tree grows next to it. It is believed that elderly people passing under its brancheswill becured of an ailing back. It is located 60 km awayfrom Jana-Ozen town. •	Underground mosque Sultan-epe. One of the most ancient places of worship for inhabitants of Mangystau, its emergence is shrouded in a number of legends. It is located in the Bay of Sarytas. •	• Underground mosque Shakpak-ata. It is believed to be named in thehonor of the mosque founder's nickname given due to the sparks flying off from his arrows, like from a flintstone (shakpak-tas). Awfully beautiful and mysterious construction. •	• Mosques Beket-ata. There are four of them, but the largest and thebest known is located in Oglandy. It is considered to be a sacred place and pilgrimage still occurs there. •	• Mosque Masat-ata. Its origin, as well as Masat-ata, is associated with a variety of legends, that is why thosevisiting the mosque become even more interesting and mysterious. Another exceptional place which we would like to introduce tourists to is Ascension Cathedral known around the world. Its height is immense - 56 meters, and this despite the fact that the building was constructed of blue Tian-Shan spruce logs not later than a hundred years ago! The choice of materials had been determined by seismic activity on the territory of Almaty. When in 1910 the city was shattered by an earthquake with the record power 11-12 points, thanks to the ingenious checks of architect K. A. Borisoglebskiy and engineer A. P. Zenkov, the Cathedral not just survived the destructive force of earthquakebut wasn'tdamaged at all - onlya cross on one of the domes had beenslightly squinted. And that's it! It goes without saying, there is a lot to look at inside. Every detail of the interior of the last century was specifically designed in the most famous workshops of Moscow and Kiev, by the masters with centuries-old experience of their fathers and grandfathers. Gorgeous handmade painting of the iconostasis and the Fedor Icon of the Mother of God are considered one of the main shrines of the Cathedral attracting particular attention. 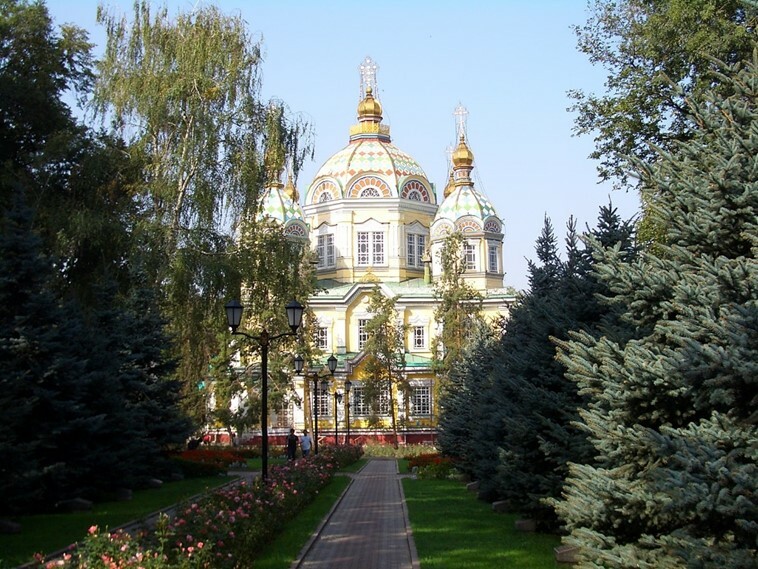 The Cathedral is located on the territory of beautiful park named after 28 Panfilov heroes and is just immersed in lush greenery. Everyone can come and enjoy this pearl of architectural art of the early twentieth century for free - under the roof of the Cathedral there is no room for enmity and strife. Here people pray andenjoy the serenity, beauty, and powerful energy of this place. Whilewalking in the park andenjoying the nature, your mind is suddenly attracted by golden glare of the domes… and by approaching a little closer there is nothing else to dobut just stand still impressed by grandeur of the ancient building. 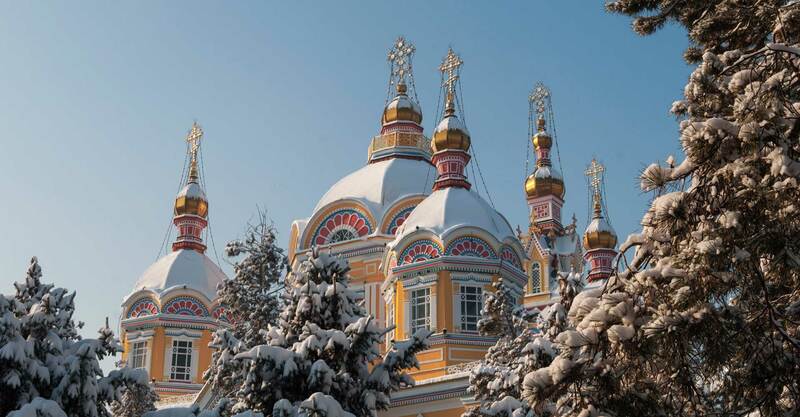 Undoubtedly, Ascension Cathedral is a place which is well worth visiting in Almaty. 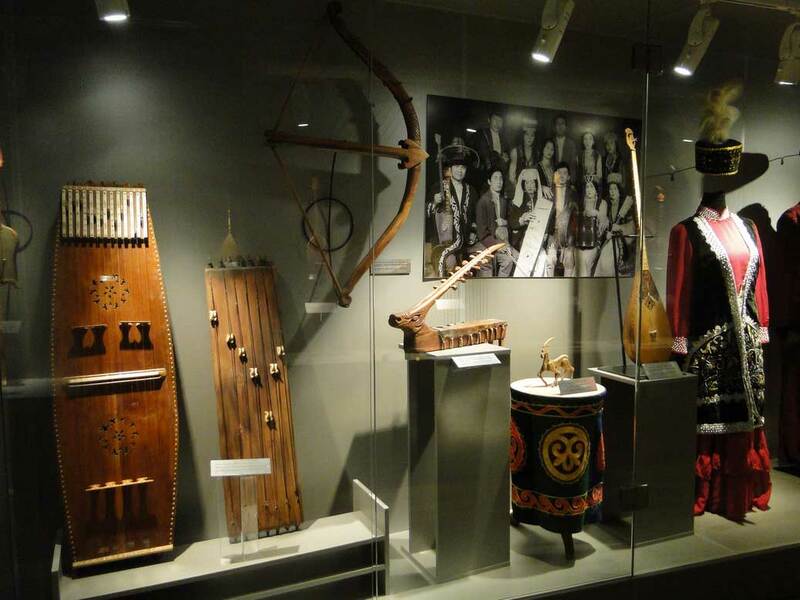 And finally, we would like to tell you about another very entertaining holy place in Karaganda region. 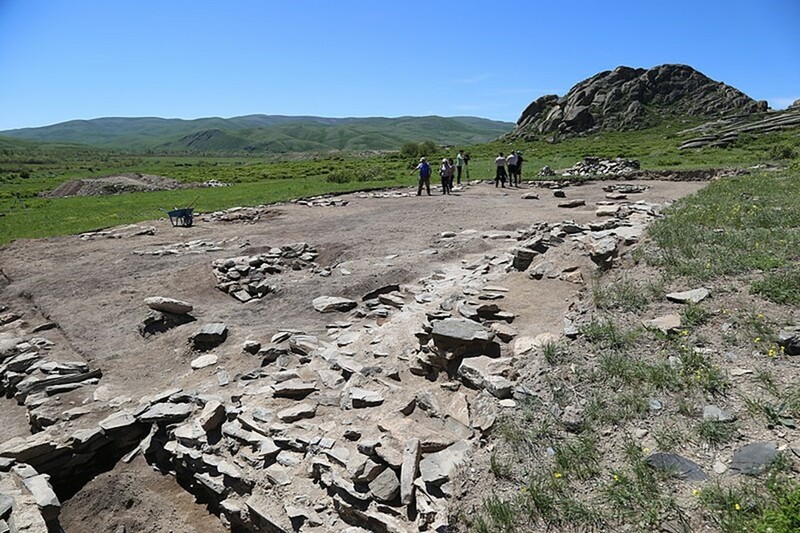 Could you imagine that on the territory of Kazakhstan, where Islam took root in ancient times, there are the ruins of a real Buddhist temple built strictly in compliance with all the canons? Most likely, not. That is why we highly recommend you to visit this amazing place located in an incredibly beautiful area surrounded by the Karkaraly mountains to the north and the Taldinka River to the south. Main building of the temple in the form of a cross, a small shrine, a kitchen,and aliving room had lost their original appearance due to barbarian raids (Buddhism had not taken root in our country), but it is stillbeing visited by yoga pilgrims and modern followers of Buddhism. This place is considered to be a source of strength, light, and undissipated energy of space. There are two places in our country: the Kyzylkent Palace in Karkaralinsk, which we told you about previously, and Abylaykit Buddhist monastery in Eastern Kazakhstan. But the second one has decayed much worse, as it was destroyed during the fight against the Dzungars. Precious Tibetan manuscripts were stored there. In the scientific community Abylaykit monastery is highly appreciated and is still being actively explored. It is located near the West Sibin Lake in a quite picturesque place as well, but still Kent Palace in Karkaraly is most popular among tourists yet. 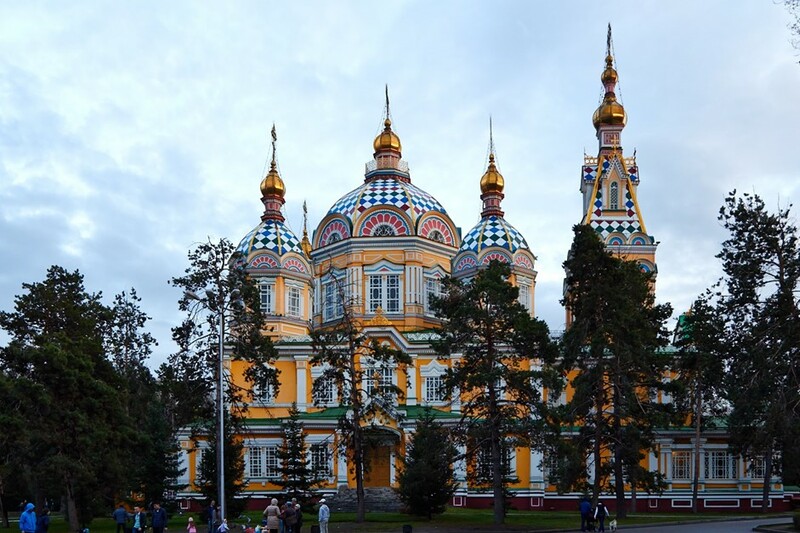 One can only get to a Buddhist temple in the Karkaralinsk by car and having received a prior special permission. You will have to go through the access gate, since all visitors must show permits, otherwise you are under the risk of getting into trouble with National Park groundkeepers, where the center of our interest is. Having overcome all of these obstacles, you get a reward in the form of the outstanding view: the stunning beauty of mountain landscapes, pristine woods, murmur of a river ... and here they are, the ruins of an ancient temple. Is not it a wonder? Our narrative of unusual sacred and holy places on the territory of Kazakhstan has come to an end, but this does not imply that the list ends. We have only scratched the surface in a huge mysterious world of the past, which borders with ours, is scarcely studied but so interesting! Visit at least one of the above and you will not be able to stop. Each new journey will take you to such energy sites, where you can hear the echoes of our ancestors, feel a surge of strength and boost for new achievements.